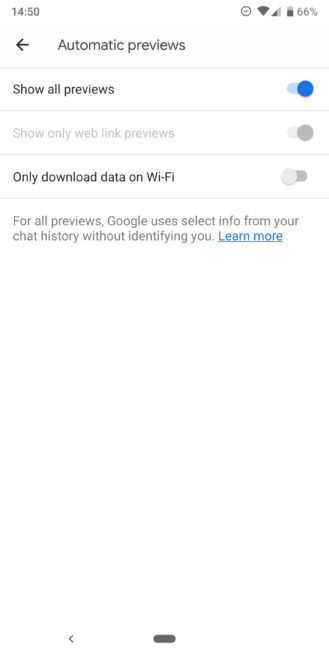 The first thing you may notice about Android Messages v3.6 is that it brings an updated app icon. Or you may not see it, because the changes are quite subtle, unless you put the two icons next to each other. The blue color is now in line with the new Contacts and Duo icons, the long drop shadow is gone, and the message bubble is smaller and white. Plus, the lines representing text messages are now thinner, wider, and light blue instead of grey. 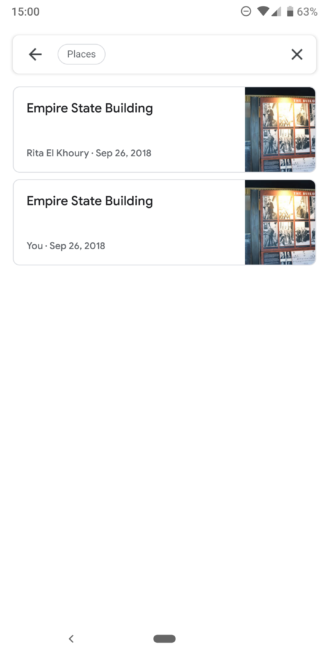 It's not much, but it does make Messages fit better with the new Material aesthetic Google is going for. Left: Messages 3.5. Right: Messages 3.6. Beyond the updated icon, there are more important changes to Messages once you open the app. The new search interface is there, and it looks good both in the white or black theme. 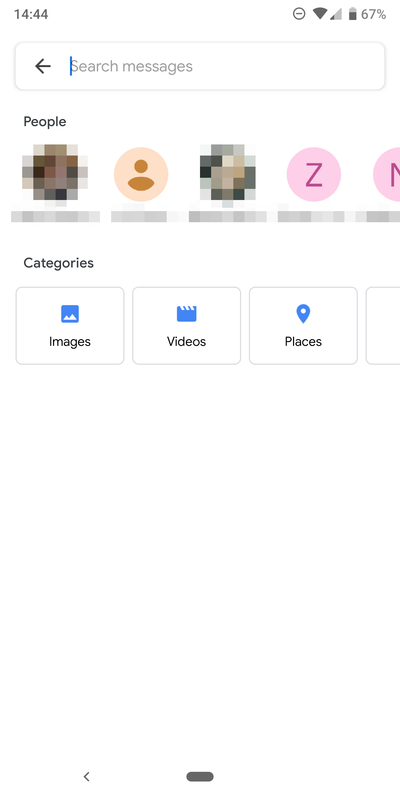 The top row shows a sliding list of your contacts and then there are four categories of media you can filter by: images, videos, addresses, and links. 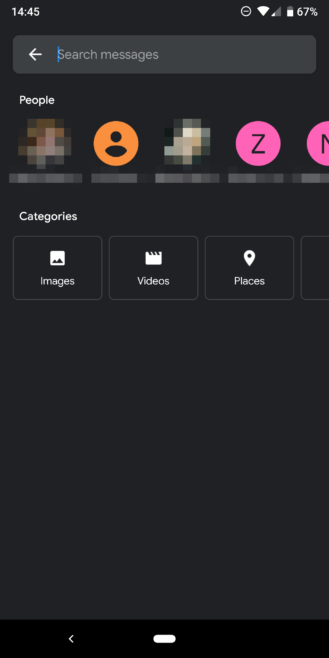 Messages 3.6's new search interface with both themes. 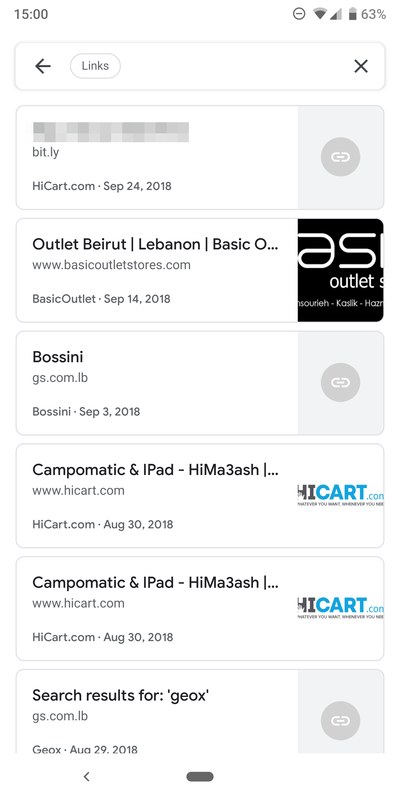 Since my carrier doesn't support RCS and no one uses MMS in Lebanon, I couldn't get many nice screenshots of all the new features of this interface. But, if you search for a contact, you should be able to see all your conversations with them (one-on-one and group chats), as well as all the media you have exchanged over time. If you'd rather filter by type of content shared, you can simply tap one of the categories below to get media exchanged with any contact. Left: Filtering by links (I get a lot of spam). Right: Adding a keyword breaks the search. Sadly, while the filters appear as bubbles in the search bar and Messages lets you type next to them, you can't narrow your search. 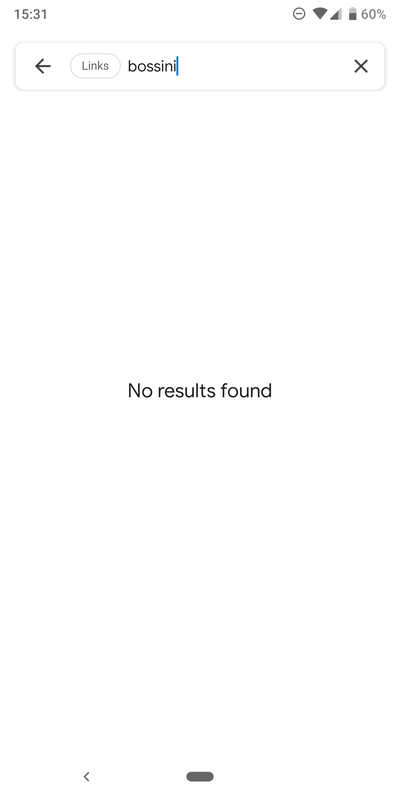 For example, I can't finds links that have the keyword "Bossini." Another letdown is that the new search interface is mobile-only for now. On the web, I can't even see a search icon. One more change I noticed while delving in the app's settings is a new setting for Automatic previews. In version 3.5, you could toggle showing link previews in Messages from known senders, and limit it to downloading previews on WiFi. 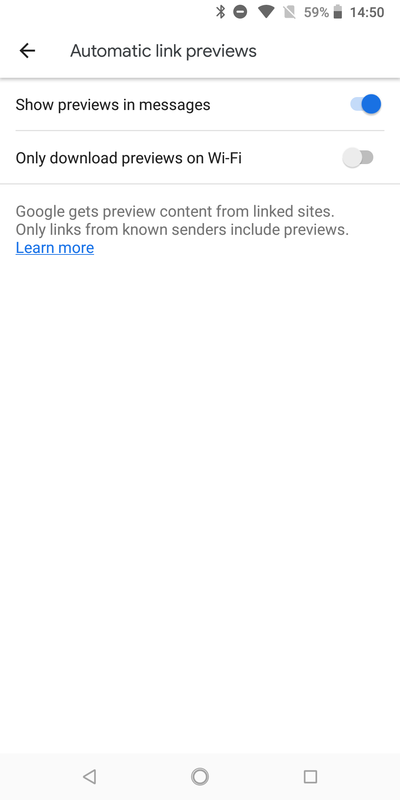 In version 3.6, the link previews are now a sub-category of all previews, which according to this support page, could include links, places, and "other types of content that the Messages app is able to recognize over time." Automatic previews settings in Messages 3.5 (left) vs 3.6 (right). Thankfully, by default, the Messages app didn't opt me into all previews. But I switched the setting on nonetheless to see what it would result in. 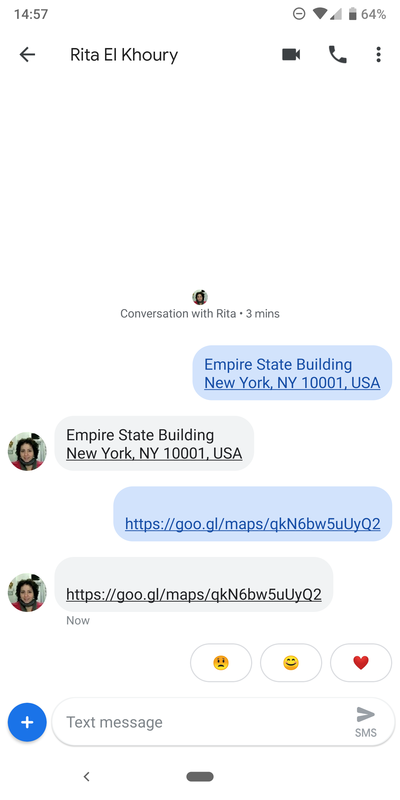 After several tests of sending back and forth addresses in multiple formats, I couldn't get the previews to show up inside the conversation. However, they did appear under the new places filter in search, so they're being recognized, but something must be stopping them from expanding as they should inline. It could be my carrier's lack of RCS, my location, some bug, a slow rollout, or that the feature isn't fully ready yet. Left: I couldn't get places to show a preview. Right: But they were being properly recognized. When they work, previews should appear like this, or at least Google says they will. Android Messages 3.6 is still rolling out very slowly on the Play Store. None of our devices got it, so you can either be patient and wait for it to show up or (and we all know you'll do this) grab it now from APK Mirror.